Ricoh has unveiled two ten-megapixel cameras: a redesign to an earlier model and a brand-spanking new snapper. Ricoh’s 7.1x optical wide-angle zoom lens Caplio R8 is the successor to the existing R7 camera, and improves on its 8.1-megapixel predecessor by also doubling the 2.7in LCD's resolution to 460,000 pixels – up from the R7’s 230,000 pixels. The R8 is 22.6mm at its thinnest point, making it slightly bulker than the 20.6mm R7, but Ricoh claims the R8’s body has been redesigned into a style that represents “a tool you want to use every day”. Many of the R7’s established features are present in the R8. For example, the R8 has a lever that allows users to switch between two zoom speeds and image editing capabilities, including colour tone, brightness and trimming. Vibration correction is also built in to help reduce the effect of shaking hands, whilst including the now standard face-recognition technology. 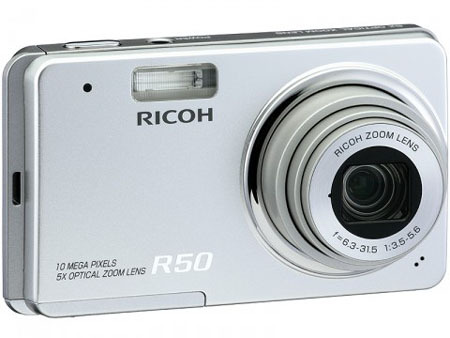 Ricoh has also unveiled the R50, which has a 5x optical zoom and 15 different image modes, ranging from Cosmetic, which the manufacturer claims enhances a subject’s skin tone, to Still Image with Audio, which lets you add a voice memo to pictures. So, if on a booze cruise, you could add drunken messages to each photo that may just help you remember why you took the picture in the first place. The R50 has a smaller LCD display than the R8, at 2.5in, in addition to a significantly lower 230,000-pixel resolution. Both cameras accept SDHC memory cards. 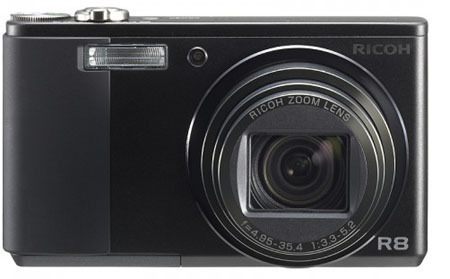 Ricoh’s R8 will be available in the UK next month in silver, black or a two-tone design for £250 (€290/$500). A UK release date or price for the R50 hasn’t been given yet.